In the long list of designer/mega-brand collabos, Pierre Hardy's collections for the Gap are an all-time favorite. Consistently gorgeous, on-trend and affordable, Mr. Hardy never insults his Gap customer by "watering down" high-fashion design. Instead, he gives the ladies what they want for the friendly price of $65. 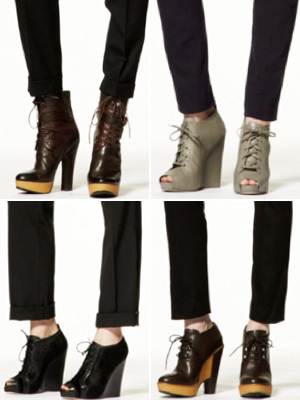 In this case, what the ladies want are sky-high denim platforms or wedges with a whimsical floral ankle-tie. We were drooling over Hardy's fun summer footwear (which hits Gap stores May 10 -- be prepared to wake up early) when we got a peek at his fall shoes, which were featured in a lookbook for pants designed by fellow Gap-collaborator, Patrick Robinson. Somewhere between a duck bootie and a high-heeled hiking boot, these new kicks are destined to become part of our daily fall uniform. There are also some pea green peep-toe wedges that deserve a little loving, as well as a higher version of the duck bootie/hiking boot heel in burgundy leather. Bravo, Pierre -- if you keep this up, we'll be Gap footwear ambassadors for the rest of 2010.